IRCTC Official is a free travelling app for Windows 8 and 8.1 to make tracking your train, finding the right trains and doing everything else related to trains is easier and fast. IRCTC is short form for Indian Railway Catering and Tourism Corporation that is a ancillary of the Indian Railways. This subsidiary is responsible for handling catering, tourism and online ticketing operations for railways. IRCTC Official is an official travel app run by Indian Railways. The aim behind the IRCTC Official travel app is to provide people with a better experience of ticket booking, reservation cancellation, easy Tatkal reservations, etc. 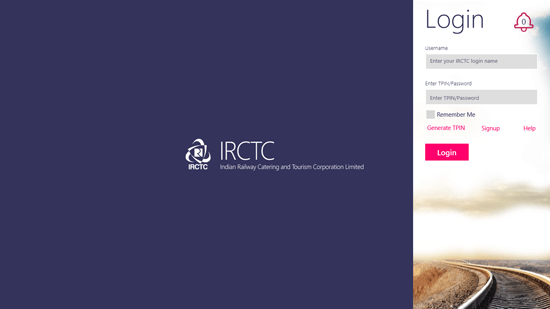 The travel app of IRCTC asks you to login to your IRCTC account, if you don’t have one then you will have to register for an account by clicking on Register on the app’s login tab. It will redirect you to the website of IRCTC for registration. Insert the login details in the travel app’s login tab and access IRCTC app. 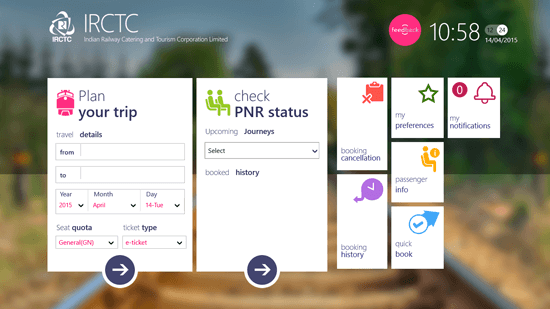 On the dashboard of the IRCTC Official travel app you will see Plan your trip, Check PNR status, Booking cancellation, Booking History, My Preferences, Passenger Info, Quick Book and My notifications. All these tiles are relevant and helpful in someway or the other. The user-interface of the travel app of IRCTC Official is beautifully designed and laid out. The tiles are clean and defining what they do clearly. Everything related to Indian Railways is right on your Windows 8 and 8.1 desktop, you don’t have to wait to open the browser and log in to your account, you can access your account and all the details related to it easily from the app. The app helps in checking the PNR status of your ticket using the Check PNR Status tile. You can see the details about your past booking of tickets using the Booking History tile on the dashboard.